Insultation can melt in poorly installed outdoor electrical fittings, leading to a short circuit. You might then have to change your entire distribution board. Because of the risk of exposure to water, outdoor sockets should have a circuit breaker. Without this you are risking electric shocks and fire. Sockets, light switches and other electric installations in wet environments can be risky. If you are planning a bathroom or kitchen renovation, make sure a qualified electrician inspects the wiring. 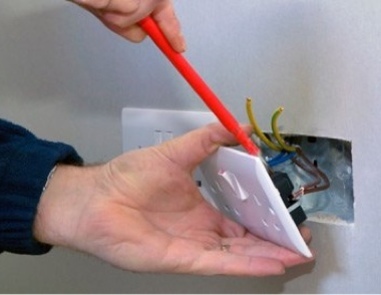 Taping up loose or exposed wiring could just cover up a serious risk. A qualified electrician should make repairs and check safety. An electric heating boiler can be an efficient solution for a smaller property, but it shouldn’t be connected to an existing socket. To operate properly and safely it should have a dedicated connection with a circuit-breaker or switch. If your light bulbs frequently need replacing it could be a sign of a wiring problem. This is a signal that you should contact a professional to check. In hot weather a ceiling fan might seem like a good solution. While it might look like a simple electrical task, if it isn’t installed properly it might not work or cause electrical sparks.